The Torrey Pines varsity baseball team won Monday's away conference game against Carlsbad (CA) by a score of 8-2. Spencer's baseball stats have been updated for the win vs. Oaks Christian. The Torrey Pines varsity baseball team won Thursday's home tournament game against Oaks Christian (Westlake Village, CA) by a score of 10-2. The Torrey Pines varsity baseball team won Wednesday's home tournament game against Eastlake (Chula Vista, CA) by a score of 7-4. The Torrey Pines varsity baseball team lost Tuesday's home tournament game against Desert Oasis (Las Vegas, NV) in extra innings by a score of 7-6. RESULTWin Varsity baseball vs. Agoura. The Torrey Pines varsity baseball team won Monday's home tournament game against Agoura (CA) by a score of 3-1. RESULTWin Varsity baseball @ Canyon Crest Academy. The Torrey Pines varsity baseball team won Friday's away conference game against Canyon Crest Academy (San Diego, CA) by a score of 6-4. RESULTWin Varsity baseball vs. Canyon Crest Academy. The Torrey Pines varsity baseball team won Wednesday's home conference game against Canyon Crest Academy (San Diego, CA) by a score of 3-2. RESULTLoss Varsity baseball vs. San Marcos. The Torrey Pines varsity baseball team lost Saturday's home conference game against San Marcos (CA) by a score of 5-2. RESULTWin Varsity baseball vs. San Marcos. The Torrey Pines varsity baseball team won Saturday's home conference game against San Marcos (CA) by a score of 13-10. RESULTWin Varsity baseball @ San Marcos. The Torrey Pines varsity baseball team won Monday's away conference game against San Marcos (CA) by a score of 7-5. Spencer's baseball stats have been updated for the loss @ La Costa Canyon. RESULTLoss Varsity baseball @ La Costa Canyon. The Torrey Pines varsity baseball team lost Friday's away conference game against rival school La Costa Canyon (Carlsbad, CA) by a score of 9-0. RESULTLoss Varsity baseball vs. La Costa Canyon. The Torrey Pines varsity baseball team lost Wednesday's home conference game against rival school La Costa Canyon (Carlsbad, CA) by a score of 5-4. The Torrey Pines varsity baseball team lost Monday's away conference game against rival school La Costa Canyon (Carlsbad, CA) by a score of 13-6. RESULTLoss Varsity baseball vs. Sage Creek. The Torrey Pines varsity baseball team lost Tuesday's home tournament game against Sage Creek (Carlsbad, CA) by a score of 1-0. RESULTWin Varsity baseball vs. Ramona. The Torrey Pines varsity baseball team won Friday's home tournament game against Ramona (CA) by a score of 6-0. RESULTLoss Varsity baseball @ Poway. 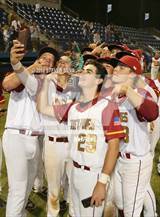 The Torrey Pines varsity baseball team lost Wednesday's away tournament game against Poway (CA) by a score of 2-0. Spencer's baseball stats have been updated for the loss @ Westview.